MONTELEONE SABINO: THE HOLY SPIRIT COMES DOWN ON THE “NEW SANCTUARY” THE HOLY VICTORY. On the solemnity of Pentecost, Sunday, May 11, 2008, the village of Monteleone Sabino was festooned celebrating the descent of the Holy Spirit, but also for the inauguration of the shrine dedicated to the patron saint, the virgin and martyr Santa Vittoria. The parish had started taking steps because there are more possible relics of Santa Vittoria. From Urbania had returned the lower jaw, and the Monastery of Sacro Speco the skull of Santa. Tuesday is the whole country that welcomed triumphantly as a bride, the nineteenth-century statue containing his other numerous relics, which came from the Parish S. Donato in Civita di Bagnoregio, accompanied by the Mayor Rino Pompeii. The sound of bells and the horn of the cars have crossed the country alerting everyone of the arrival of Santa. Many faithful gathered in the Parish Church for prayer, along with the parish priest of Bagnoregio and the Mayors and Monteleone. The day of the party arrived from various places other relics accompanied by the faithful: from Santa Vittoria in Matenano (AP), the relics were accompanied by the parish priest, the mayor and the Brotherhood of Santa Vittoria; by Pisoniano (RM), they brought the relics the Mayor and Father Virgilio, o.f.m., and a faithful representation. Were agreed at the party, a priest of the Diocese of Rieti, some deacons, the Franciscan Sisters Angeline, numerous civilian authorities and representatives from the police, many faithful of Monteleone and elsewhere. The long and colorful procession began at 10:00 hours from the parish church. They participated in the procession, besides the guests listed above, all church groups including the three Brotherhoods of the Parish of Monteleone, the assembled Brotherhood of Oliveto Sabino, the Prayer Group and the Ginestra Band, and Band of Monteleone. The whole procession stopped in front of the shrine, where the Bishop of the Diocese of Rieti, S. E. Rev.ma Mons. Delio Lucarelli cut the ribbon. Coming first in the Sanctuary, followed by the parish priest and the mayor of Monteleone, the prelate discovered a stone commemorating the event, located in the atrium. To animate joyfully solemn Holy Mass, he thought the youth church choir John Paul II. After a welcome to the Bishop and guests uttered by the pastor, the Bishop began the ceremony with the blessing of the Shrine. During his homily he stressed the role of the Holy Spirit in the life of the Church and of the individual baptized, and encouraged the two days of confirmation candidates, Giorgia and Captains Lorenzo De Santis, to be authentic witnesses of Christ. 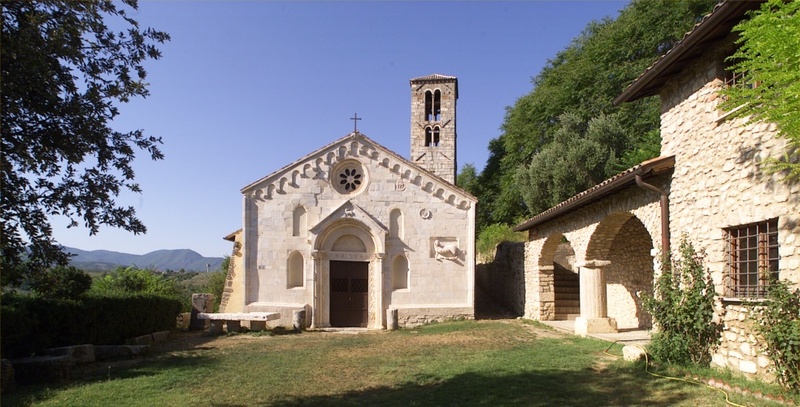 As for the sanctuary, the bishop recalled how the place of worship was very dear to the ancient time of Monteleone as to all the faithful of the Diocese of Rieti and at all levels of Vittoria holy devotees. Dismissing the assembly, thanked all the participants and organizers and asked all major and constant commitment because the sanctuary is placed at the center of all the parish activities and lived as a place of intense prayer and heard and experienced worship. The procession resumed the start, coming in the country, and, passing through the historic center, was completed in April Piazza XXIV, where the Bishop gave the blessing with the relic in the form of Santa Vittoria arm. After pointing out that the following year the parish Oratory would have celebrated his twenty years, the pastor invited everyone to gather in the Parish Church. The Bishop, priests, deacons, sisters, civil authorities, representatives of the security force and other guests gathered in prayer, for a brief moment, at the tomb of Santa Vittoria from Bagnoregio. In the enchanting scenery of the Farfa river valley, in the heart of Sabina, less than an hour's drive from Rome, in one of the most intact and protected places of central Italy. To stop time and think about what we have valuable: ourselves.